(Natural News) Did you know that pistachios, which are considered nuts, are actually seeds? When eaten in moderation, pistachios can promote weight loss and even improve your blood glucose levels. Pistachios are full of antioxidants such as phytosterols, xanthophylls, and gamma-tocopherol (a form of Vitamin E). These antioxidants possess anticancer, anti-aging, and anti-inflammatory properties. Your body needs vitamin B6 for various functions such as blood sugar regulation and the formation of hemoglobin, a molecule that carries oxygen in red blood cells. These green nuts are also full of potassium. In fact, an ounce of pistachios has more potassium than half a large banana. Pistachios can help you feel fuller for longer periods. These nuts contain at least three grams of fiber, six grams of protein, and 13 grams of fat per serving. Pistachios can improve your blood pressure by enhancing endothelial function. The endothelium is a thin membrane that lines the inside of your heart and blood vessels. Pistachios can also improve blood lipid profiles. These green nuts do this by increasing “good” high-density lipoprotein (HDL) cholesterol, reducing “bad” low-density lipoprotein (LDL) cholesterol, and improving your HDL to total cholesterol ratio. In addition, pistachios can improve blood glucose levels, which can reduce your risk of Type 2 diabetes. Pistachios are also good for your gut. Eat these nuts to boost the number of beneficial bacteria in your gut that produce butyrate, an anti-inflammatory fatty acid. Butyrate helps protect you from various health problems like obesity or autoimmune disorders. Last but not least, pistachios help prevent ocular diseases. Consuming pistachios can lower your risk of conditions such as cataracts or macular degeneration. This is due to their high concentration of two eye-friendly carotenoids: lutein and zeaxanthin. 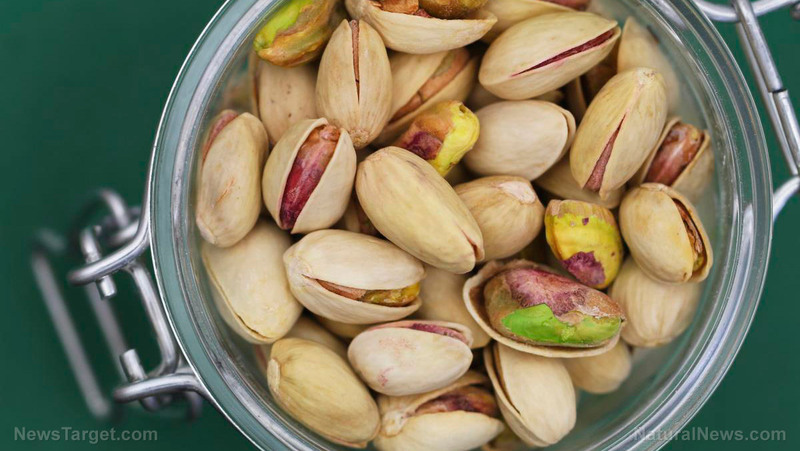 Eat a handful of pistachios if you want to lose weight or just want to munch on some healthy snack. Like other types of healthy foods, you must eat pistachios in moderation to reap its health benefits. An average serving is made up of 49 kernels or at least an ounce of unshelled nuts. Add them to a breakfast of granola and fruits. Crush them and use them as a topping on your favorite fish or meat dish. Sprinkle them over rice, soup, or vegetable side dishes. Use it as a healthy homemade pizza topping. Make pesto or nut butter. Make a pistachio dessert. Add some nuts to freshly cut mango, ginger, and ground cinnamon. You can purchase either shelled or unshelled organic pistachios. Your option will depend on your patience. Some people might prefer eating a handful of pistachios to shell, but others, especially kids, may have trouble unshelling the nuts. Always consult a healthcare professional before you add pistachios to your diet. Some individuals may experience some gastrointestinal distress such as bloating, diarrhea, gas, or stomachaches if they consume too many nuts in one sitting. Exercise regularly, follow a nutritious diet, and snack on some pistachios if you want to maintain a healthy weight and reduce your risk of certain diseases.